Years ago, Canada and the U.S. came together to end the acid rain threat. What changed? Nobody talks much about acid rain anymore. But the one-time scourge of North American lakes and forests got a mention yesterday at the funeral of former U.S. president George H.W. Bush. Nobody talks much about acid rain anymore. But the one-time scourge of North American lakes and forests got a mention yesterday at the funeral of former U.S. president George H.W. Bush. 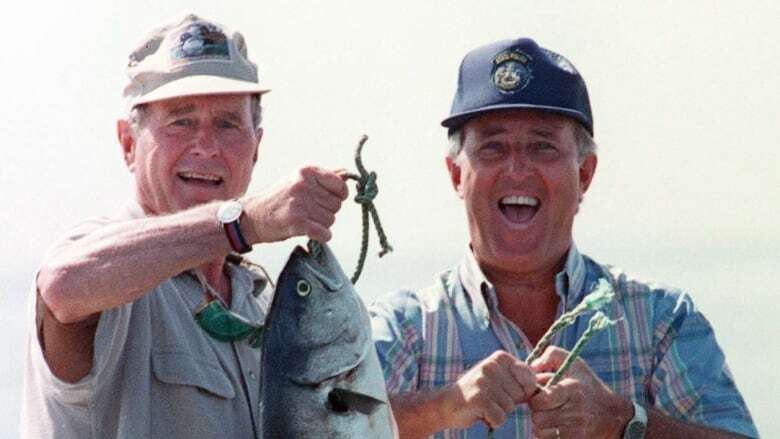 Delivering a eulogy for his old colleague and friend, former prime minister Brian Mulroney singled out Bush's environmental record as a lasting part of his legacy. "President Bush's decision to go forward with strong environmental legislation, including the Clear Air Act, that resulted in the Acid Rain Accord with Canada, is a splendid gift to future generations of Americans and Canadians to savour in the air they breathe and the water they drink," Mulroney said. The fact that the acid rain threat has been mostly eliminated testifies to how effective Canada and the U.S. once were in responding together to a complex, shared environmental problem. After years of prodding and lobbying, the U.S. updated its Clean Air Act in 1990. New rules cut emissions of sulfur dioxide and nitrogen oxide, key elements in the creation of acid rain. The reductions were achieved in part by introducing the United States' first national cap-and-trade system aimed at major polluters. That was followed by Canada-U.S. Air Quality Agreement signed by Mulroney and Bush in Ottawa in 1991. The agreement was aimed at reducing pollution on both sides of the border that caused acid rain. And it worked. "It was, by and large, a success," said John Smol, a professor in the Department of Biology and Canada Research Chair in Environmental Change at Queen's University. "I'm not saying acid rain is now completely no longer a problem. But (the agreement) actually did make major changes to the environment. And, in many ways, it's a good example of how you can actually do this type of legislation, not devastate the economy, and help the environment." Nearly three decades after Canada and the U.S. agreed to address the problem, Smol said, Canadian lakes are still in the process of recovering from acid rain. "I think we caught it in time. With many environmental problems, if you wait too long you can't go back," he said. Looking back on the fight against acid rain, Smol said he can now see it as a practice run for the much more daunting battle against climate change. "Climate change is much more complicated and the consequences are far worse," he said. The comparison between the two environmental threats only goes so far, however. While acid rain was a relatively straightforward cross-border matter, climate change requires global action. And while acid rain was curtailed by reducing certain emissions, slowing down climate change likely will require much more: a complete phase-out of fossil fuel use. Keith Stewart, senior energy strategist with Greenpeace Canada, said he still believes there are important similarities that give him hope for progress on climate change. "Acid rain was, relative to climate change, easier to solve," he said. "But the key lesson from acid rain, I think, was when we stopped listening to industry lobbyists telling us this would destroy the economy." Stewart acknowledges one major difference between the fight against acid rain and the fight against climate change. The political climate in the United States has shifted dramatically since the days of the first President Bush — and the current White House tenant is much less interested in environmental causes. President Donald Trump announced last year he was pulling his country out of the Paris climate accord. He also has actively campaigned to bring America's coal industry back to life — the industry ultimately responsible for the emissions that contributed to acid rain in the 1980s. "Donald Trump is keen on reviving the coal industry, trying to burn more coal. The silver lining is that he has proven remarkably incompetent at doing this, largely because the economics are against him." While Stewart questions the late president's overall environmental record, he says there can be no doubt on this issue he was a success. "On acid rain, he proved that conservatives can take environmental issues seriously and be part of that solution. And I think that's something conservatives in Canada need to learn."